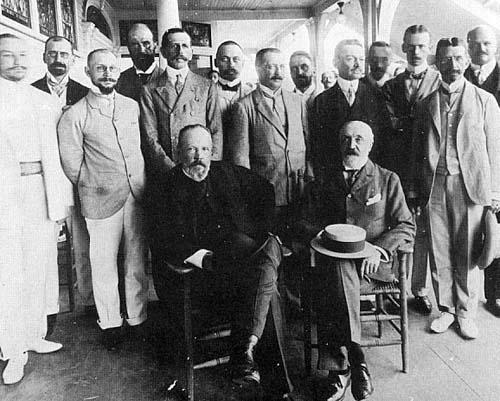 The Russian delegation at Wentworth-by-the-Sea with Vitte and Baron Rosen seated. One-hundred and eight years ago Thursday, Russian and Japanese delegates came together in Portsmouth to sign a treaty ending the Russo-Japanese War. Thursday afternoon in downtown Portsmouth, local lawyer and historian Chuck Doleac led a ceremony celebrating the treaty’s anniversary. He told a small crowd that Portsmouth residents helped make the treaty a reality by extending social invitations to the two delegations as they considered giving up negotiations. Although the then-President wasn’t present at the signing, Theodore Roosevelt later earned a Nobel Peace Prize for his role orchestrating the peace treaty.